Yes it is true. If I had to pick the tackiest place on earth (at least that I have ever seen) then Niagara Falls would win hands down. I was visiting family in Canada and had always dreamed of seeing this natural wonder, so was really excited when we decided to make a day trip there from Toronto. Excited turned to perplexed when we drove into the small town, the streets looked like the aisle of a really tacky $2 store. On either side were lots of cheap and distastefully fitted shops selling tasteless souvenirs and useless trinkets. From the obligatory fridge magnets and snow domes to personalised I Love Jesus at Niagara Falls key rings. This town brought a whole new meaning to the phrase “Tourist Town”. Its sole purpose appeared to be just to sell things with no real purpose to people who didn’t need them. Heading to the see the waterfall we were bombarded by people trying to sell us carriage rides and ponchos. Niagara is sometimes held up as a great honeymoon destination, hence the horse drawn carriage, but if this was romance then I was happy to be single forever. The falls themselves are simply magnificent. It was possible for at least a few minutes to forget about the throng of people clicking away around me, and just take in the sight of this spectacular natural phenomenon. So for a few moments I just stood and watched, before turning around and seeing the catastrophe that is now Niagara Falls. After a little time wandering around town we returned to the falls to see the “Disco”. 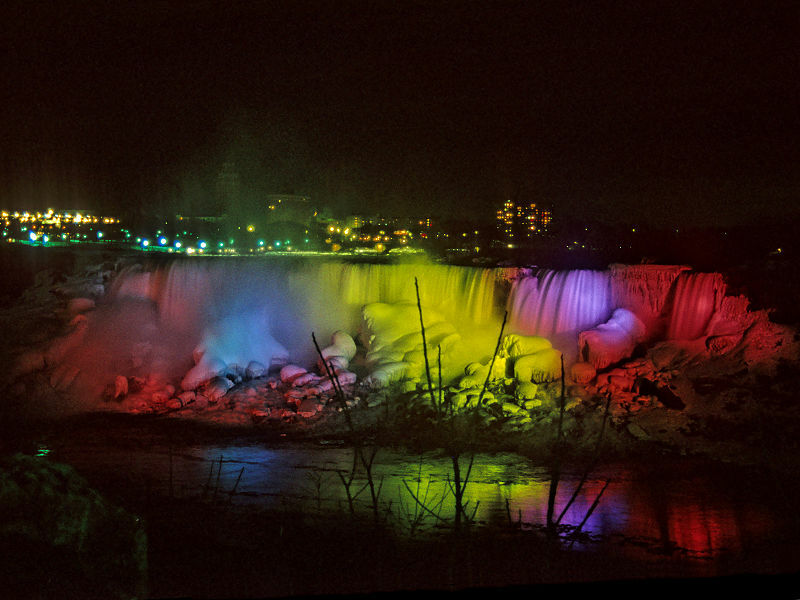 To my horror a light show had turned one of the greatest natural wonders of the world into a rainbow striped eyesore. So feeling rather disappointed, we headed back to Toronto. So would I recommend Niagara Falls to anyone? Well it is a spectacle certainly worth seeing once, but if the man of my dreams ever suggests it for a romantic getaway…. hahahaha 🙂 Sounds like you had a blast! 😛 I feel like too many beautiful places these days are ruined by becoming “tourist attractions”. It is sad to see natural places ruined by tourism, but I feel like the tackiness has just taken over Niagara Falls completely now and made it the “new” tourist attraction there.